A superb 3 double bedroom apartment with two en-suite shower rooms set within the fishing village of Cawsand commanding spectacular views across Cawsand Bay and Plymouth Sound with gated underground parking. 1319sqft, Open Plan Living, Fitted Kitchen, Three Double Bedrooms, Two En-suite Shower Rooms, Bathroom/WC, Balcony and Designated Parking Bay within Secure Ground Floor Garage. SUMMARY A superb 3 double bedroom apartment with two en-suite shower rooms set within the fishing village of Cawsand commanding spectacular views across Cawsand Bay and Plymouth Sound with gated underground parking. LOCATION The Bay is a stunning newly built development situated on the waters edge with spectacular panoramic views across Cawsand Bay to Plymouth Sound. The twinned villages of Kingsand and Cawsand are situated on the Rame Peninsular with 3 wonderful beaches and local amenities to include a village convenience store, several pubs, restaurants and tea rooms. 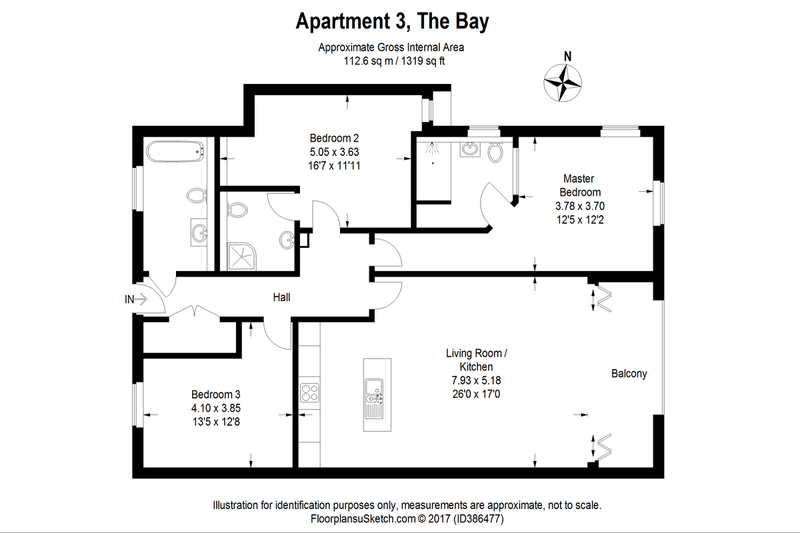 DESCRIPTION This first floor apartment has been finished to the highest of standards and offers spacious accommodation with sea views from the balcony and master bedroom. Open plan living/dining/kitchen area with bi-fold doors leading onto balcony with sea views across Cawsand Bay towards Plymouth Sound. Fitted kitchen with island, quartz worktops with integrated quartz sink and Quooker boiling tap. Integrated Miele appliances to include: fridge and freezer, ceramic hob, oven, combination microwave and grill, extractor hood, dishwasher and wine cooler. Master double bedroom with window to the front providing sea views, en-suite shower room with walk in shower, Villeroy & Boch vanity unit and wash hand basin and WC. Bedroom two is a further double with bedroom three a good size single. Bathroom is fitted with a contemporary suite consisting Villeroy & Boch vanity unit, wash hand basin, bath and WC. OUTSIDE Designated parking bay within secure communal garage. NOTE Photographs and CGI’s are for representation only.